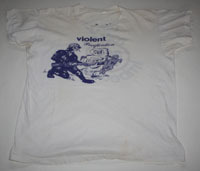 Original 1982 vintage t-shirt! Size XL, 50/50 Belton brand measuring 20½" pit-to-pit and 27½" from rear collar to bottom hem. Mail-ordered by the original owner from either Zed or Poseur in late '82. Some sweat staining around collar and pits and some small stains on back. 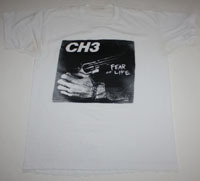 Buyer will be provided with a picture of the original owner wearing this shirt in 1983. Original 1983 vintage t-shirt! Sleeves trimmed. Measures 18¼" pit-to-pit and 23½" from rear collar to bottom hem. 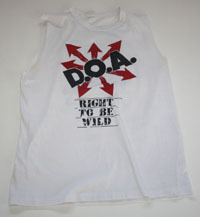 Purchased by the original owner in Spring 1983 at a DOA show. Original 1984 vintage t-shirt! Size XL, 100% cotton Fruit of the Loom brand measuring 21" pit-to-pit and 23¾" from rear collar to bottom hem. Purchased at a June 1984 DRI show. Some light staining.